My third year of celebrating Johann Sebastian Bach's birthday: who was this guy anyway? This is my third year of celebrating the birthday of Johann Sebastian Bach. I did this in 2012 and in 2013. The first year, I consciously chose to play some of his music rather than read about it (or about his life). The second year, I played some more of his music, on flute. This year, I did something different. First of all, I learned that I had gotten his birthday “wrong” in the past two years! This year I decided to celebrate the actual birthday (in terms of passing of time) rather than his birth date (which was March 21 according to the old Julian calendar). A minor detail, but symbolic of my intention. 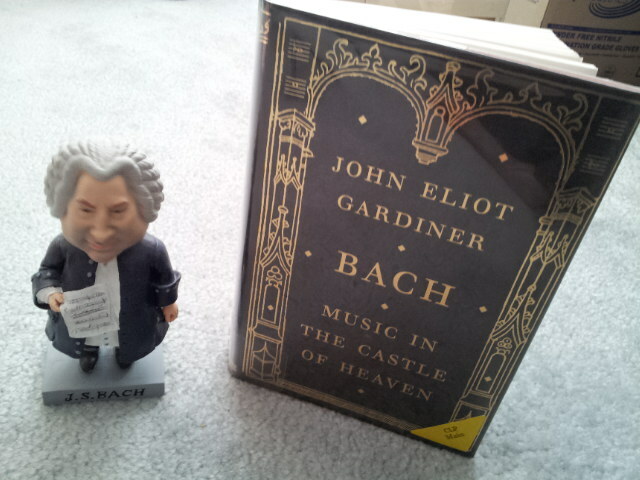 This photo is of my Bach bobblehead next to a new book about Bach by John Eliot Gardiner that I just got out of the Carnegie Library today; I had decided that for this year, I would learn more about Bach, the man. A couple of months ago, I came across an interview “Bach unwigged: the man behind the music” with John Eliot Gardiner, who had finally come out with his long-awaited book about Johann Sebastian Bach, “Bach: Music in the Castle of Heaven”. I learned that Gardiner tried to get inside the mind of Bach, through his music as well as texts, exploring the possible contradictions within them, and what that might mean about Bach’s inner thoughts and feelings about things. Obviously, this is a somewhat subjective exercise, but definitely an intriguing one. Also, Gardiner examined facts about Bach’s actual life, including arguments and disputes with authorities, and his basically crazy busy existence in all his professional and personal roles. When I saw that interview transcript, I was a little curious, but not enough to rush out and get the book. But then I kept on seeing links to reviews of the book, and most recently, last month, after reading this one, I thought, hmm, maybe sensationalist, but maybe worth checking out: Bach as “reformed teenage thug”?! I started with a “shortcut” to the book: I found a documentary online that Gardiner was involved in. It’s still quite long (an hour and a half), but at least you get to see scenery, see musical excerpts being performed, and it’s not a 600-page book! Of course, I had to play some of his music to celebrate also. I pulled out my flute and ran some of his flute sonatas’ movements along with keyboard backing tracks. Maybe one day I’ll write more about Bach’s Chaconne, but for today all I will say is, this is my favorite music of all time of any kind, and what I would hope to leave this world with. I’m generally more interested in the artistic output of people rather than their life stories, but thanks to the positive and somewhat sensationalist coverage of Gardiner’s new book, I took the bait!